The fall exhibits began with “Transantiago: Chronicles Concealed.” This show was the first time Colectivo Dunne Hermosilla had work shown in the United States. The Chilean collective is three men, Cristóbal Cohen, Gregory Dunne and Marcelo Hermosilla. The series provided a way for an audience in Connecticut to look through windows to view streets of Santiago, Chile. 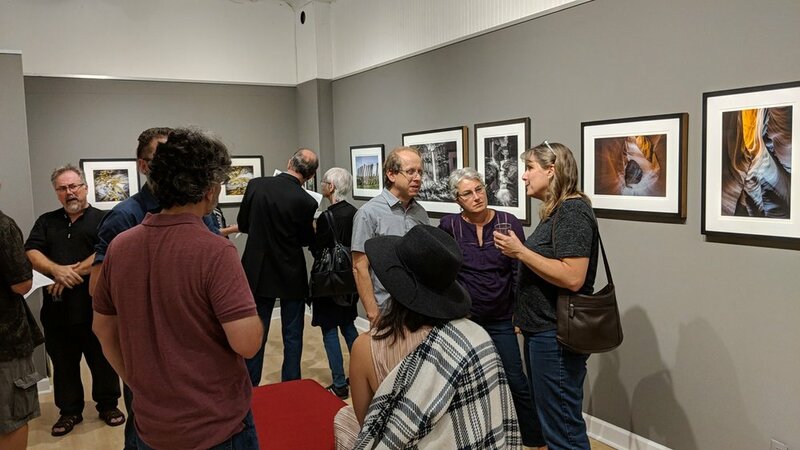 At the opening night it was clear that the audience was interested in the potential stories behind the people featured. Viewers questioned whether one woman looked sad or lost in thought. A bus driver can be seen through colorful reflections on the window, unaware that this day has cast him as the centerpiece of a work of art. The collective has created a show where the audience becomes commuters on the streets of Santiago. There are 21 pieces in the show, representing 21 windows through which the group shot their photographs. The grime and dirt is not avoided or edited out, but rather used as an abstracting feature of the pieces. The effect is a series of photos that have a modern art quality, abstractions that cause the audience to take a step back and view pieces at different angles. Once the viewer pieces together the image, often a familiar scene can be found. Despite the differences in cultures, the manner in which this Chilean art group created their series allows for audiences all over the world to feel a connection to Santiago. Their intention to show the contrast between "urbanity and humanity" is recognized and shows through. In a different manner, our current show "Zen con Son" requires viewers to add together visual clues to understand the completed image. Miguel Trelles is a Chino-Latino artist. His Cuban and Puerto Rican heritage paired with growing up in Puerto Rico gave him a rich knowledge of the Greater Antilles. As an art lover and a curious mind he studied art history and found a connection with Chinese Art throughout the ages. He recognized a similarity between the scenery depicted in Chinese art and the landscape in the Greater Antilles. To the average observer, the first thing that draws them in is the bright color and often foreign symbolism. The intrigue is in attempting to break down the reasons behind the potentially conflicting subjects. To those familiar with Chinese art, the symbolism is a lot easier to identify but the interest is in the modification that Trelles has made. The audience at the opening was a mixed group. Many seemed able to break down and understand the majority of his influences. His combination of cultures shows through in a way that highlights each one rather than creating an entirely new style. He pays homage to his own cultural background as well as shows his tremendous respect and knowledge of Chinese culture. A new modern art piece pays homage to Johann Gutenberg mere months after the 550th anniversary of his death. Johann Gutenberg revolutionized the printing process. Determined to make printing cheaper and easier, he completed the first book by movable type. The Gutenberg Bible was a show stopper. Documentation found shows that he printed 200 print copies and 30 velum copies . Today, very few copies exist and Yale University is lucky enough to have a complete version. Today this copy is in the Beinecke Library but it was first housed in the Gates Classroom. This bible was the first book of its kind and it paved the way for modern printing. In the libraries at Yale it sits among the future that it created. This dichotomy between modern and historical exists throughout Yale. When a campus is as old as Yale is, there are often unique architectural elements. This creates the issue of highlighting both modernization and preservation. Richard Rose is a lecturer, critic, and master printer. He was selected to create a piece of art for the Gates Classroom. In Yale’s quest to modernize different segments of their campus they took an existing piece of art away. This left behind a space that the entire classroom centered around. 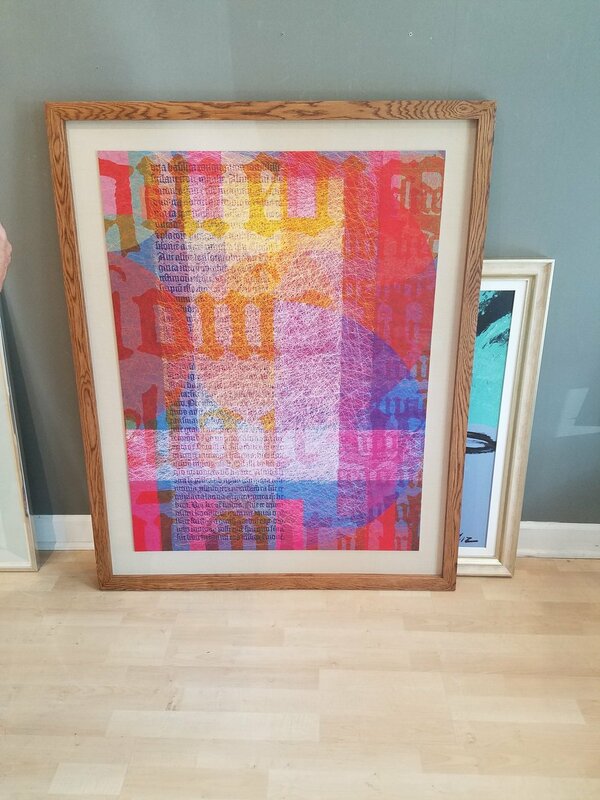 As the go-to framers and curators for Yale, our shop was contacted to make this project work. The unique part of this was the architecture of the classroom. It included a wooden frame flush with the surrounding intricately carved woodwork. This meant that the piece had to be custom made to fit the context visually as well as the physical space left behind by the previous art. Richard set to work researching the architectural history as well as the Gutenberg Bible, and we began brainstorming. Step one was removing the existing piece. In doing so we were able to measure the space that the piece would occupy. Then we determined how we would install it without disturbing the existing architectural artwork. Determined, Richard brought us several drafts, each one more detailed than the last. Each time we looked at wood samples, resolving to find the perfect one to use to create the frame. 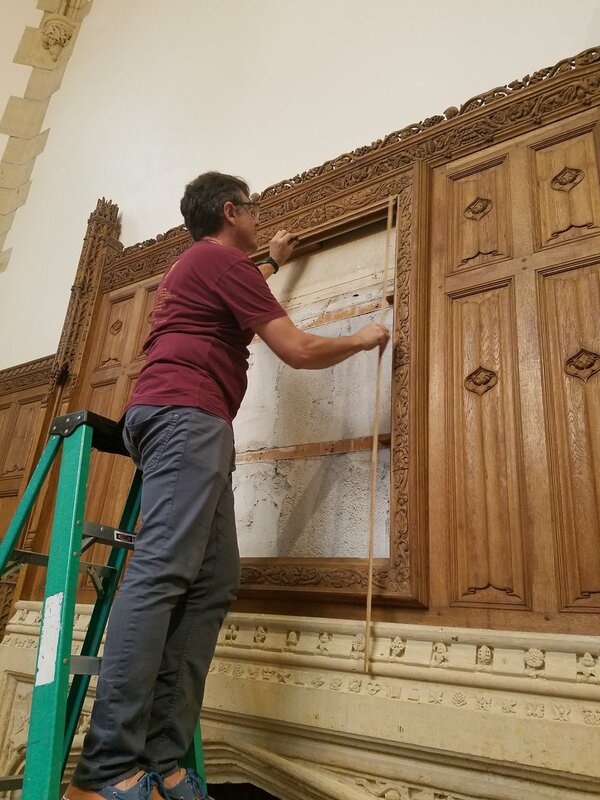 The goal was to highlight his work and pay respect to the beautiful historical woodwork. The result was a one of a kind hand-made wooden frame. Then Richard came in, bringing with him “Chords: Text (After Gutenberg)." The final piece showed incredible growth. Bright colors highlighted architectural shapes and letters taken from the Gutenberg bible. 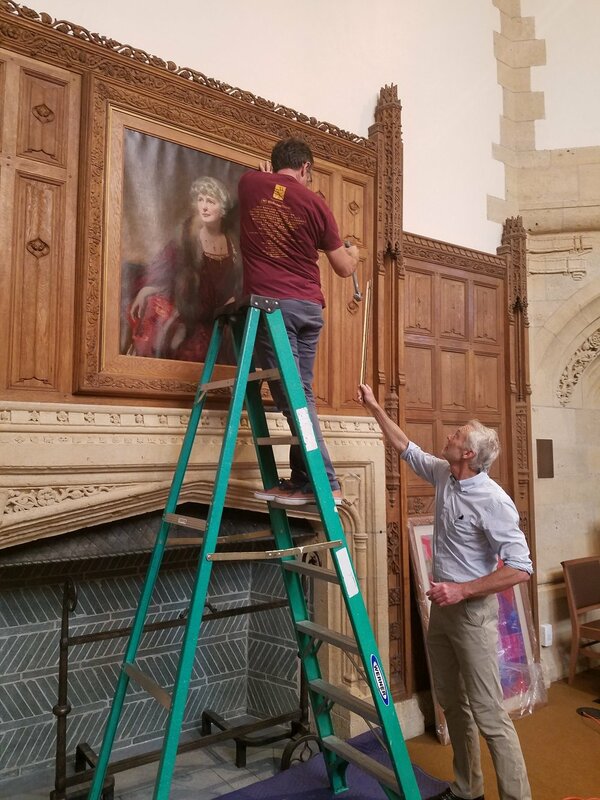 Upon completing the framing we returned to Yale. Once again we took the original artwork down. 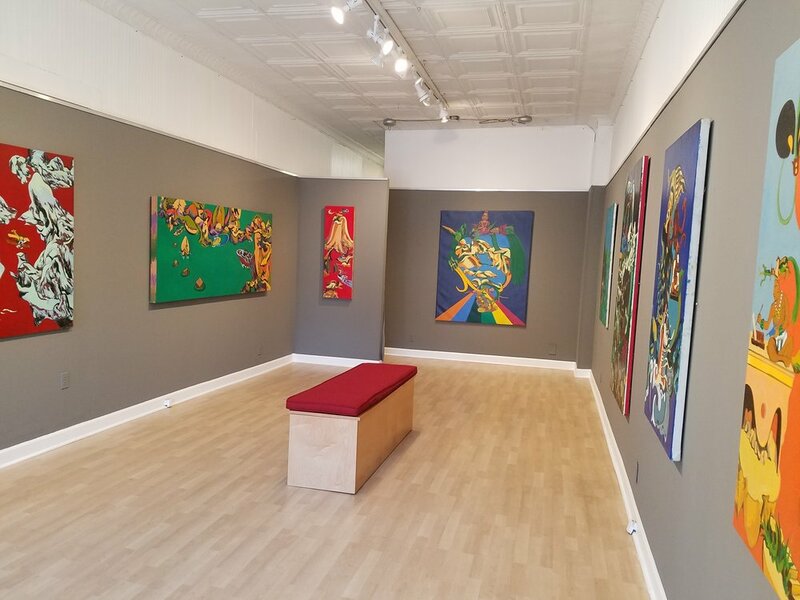 Richard's piece went up and the effect was immediate, the space changed. It fit into the architecture, with the frame blending in seamlessly. In a room with many windows, the piece still managed to bring in a new vibrancy and light. On Thursday August 16th an artist came into our store. 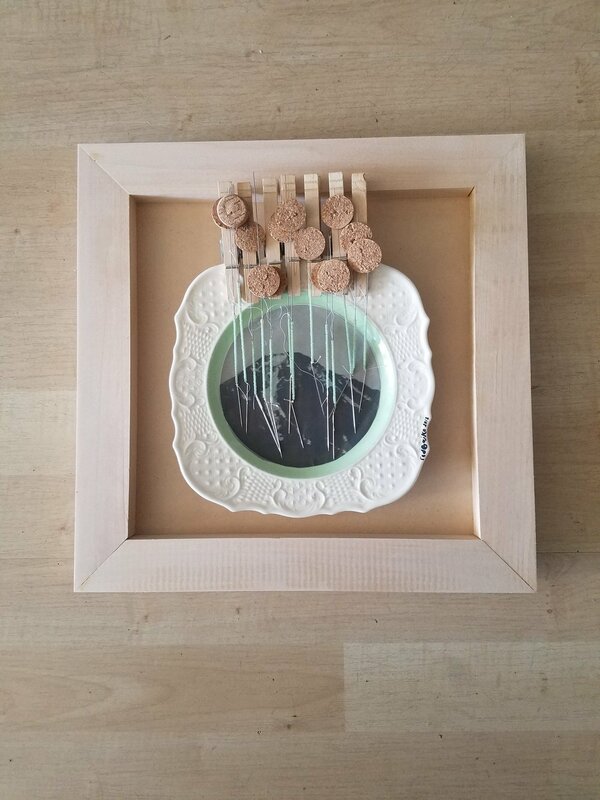 Gabriella Radujko brought with her a plate series titled “It’s a Natural World.” The series consists of plates of different sizes and materials. Each one is unique in its content and composition. First we assessed the artwork, taking note of the many different materials used to create it. 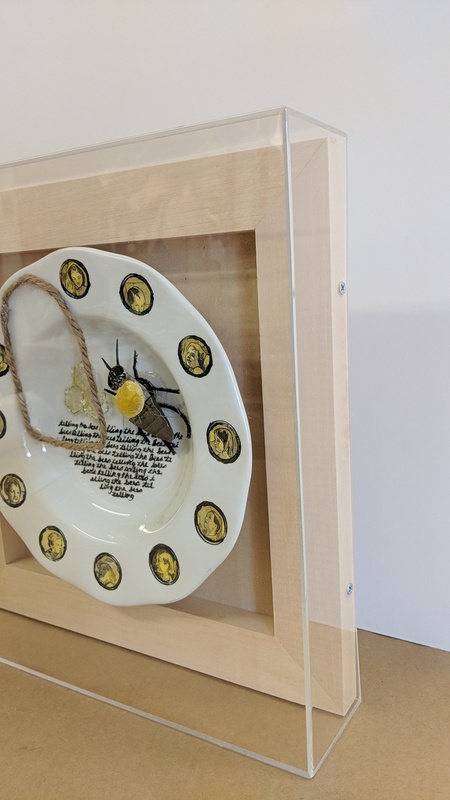 The plates were ceramic, crystal and porcelain. Each one uses different materials to tell a story. We noted the fragility of the pieces and began to brainstorm ideas. The goal was to find something that showed off the pieces but remained archival and centered around preservation. Shadowboxes provided the depth we needed, but the solid frame prevented the pieces from being viewed in their entirety. So we went with a different solution, plexi boxes. After deciding on clear plexi boxes, we began discussing the other visual aspects. Rather than putting a colored mat behind the piece we opted for a more natural look. By using wood behind the piece we were able to highlight a reoccurring theme of the series. We determined the size and depth of each one, creating varying sizes. To maintain a cohesive visual, we decided to keep all the pieces square. Then we edited our primary decision to have wood as a backdrop for the pieces. Upon the arrival of the pieces, we realized that there was a way to have a frame within the box. Instead of mounting the plates on the wood and calling it a day, we brought in a new piece. 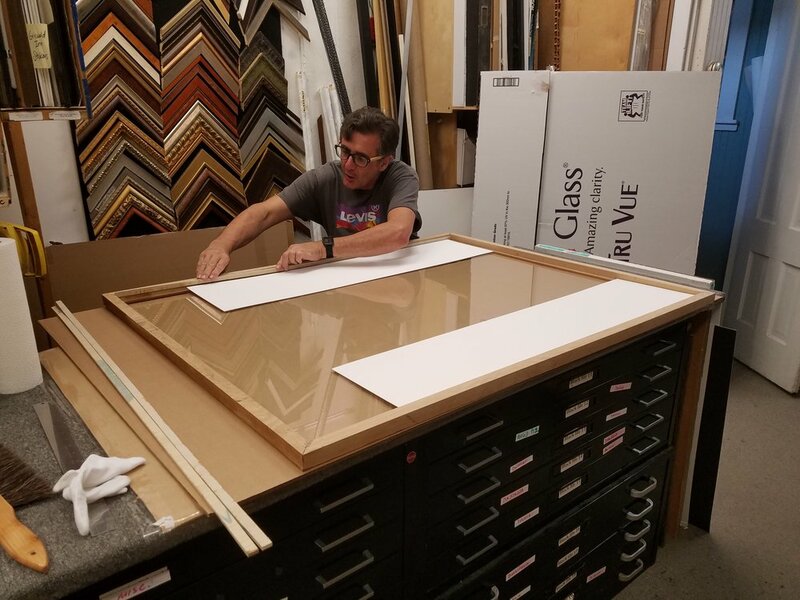 Typically when we create plexi boxes we use a mat as a background and a wooden frame behind it for added support. In this case we brought it to the foreground, framing the plates within the plexi. This added the affect of a more traditional frame without being visually obtrusive. To hang the pieces with the most stability we used french cleats for the hanging hardware. This would allow for easy removal as well as stable hanging. The finished pieces showed off Gabriella's intricate work without drawing attention to the boxes themselves. They will hang in her new studio in Erector Square along with a fifth plate that we are currently framing. As many of you who visited us in August noticed, we had a gap in shows. This, of course, sparked some interest and discussion. Newcomers even thought we were a new business! But, this was, in fact, due to August being the chosen month for family vacation. Coming back from vacation we were all regrouped and refreshed. We repainted our walls and started installing our new exhibit. 24 beautiful photographs by Peter Rivera went up and we opened the show on Friday night. It was his first photography show and everyone had a great time. Peter wrote about his photographic journey in pamphlets that go with the show. In them he details the location and story behind each photo. He takes us from Arizona to Upstate New York, from Iceland to India. The common consensus was that we want to go where Peter takes photos. The show sparked conversations among visitors about past and future travel destinations. Many became intrigued by the blue waters of New Zealand and rolling green hills of Iceland. Peter described these new and unseen places as "places of solitude." A couple, smiling at the Dead Sea, coated in mud, drew people in. Those who viewed it expressed how well it captured the feeling of peace and happiness. This photograph stands out, not only for its depiction of people, but for the curiosity it causes. This show has something for everyone; the photographer, traveler, art lover or curious mind. For those who wish to visit, it will be up until the 29th of September.